Today's guest post is from the awesome Malia from Playdough to Plato. 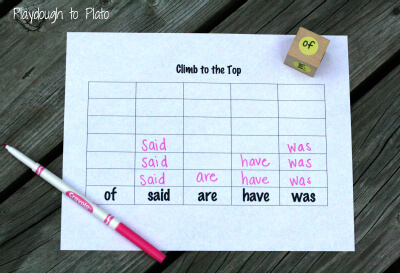 Playdough to Plato is one of my "go to" blogs for fun literacy themed activities. She has shared so many fun learning games like Showdown and Alphabet and SightWord Scramble and I love her idea for DIY Easy Readers. Now, I will turn over the blog to Malia who will be sharing an awesome Sight Word Game with you! I am a little obsessed with finding and inventing fun ways for children to learn to read. Ok... make that VERY obsessed. I could spend hours searching through teachers' blogs and pinning creative early literacy activities to my Pinterest boards. 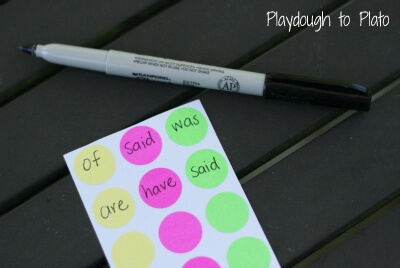 So when a first grader I tutor was struggling to memorize sight words a little while back, I made it my personal mission to design several entertaining sight word games that were both entertaining AND effective. Hands down, one of her favorite activities from the bunch was this high energy die game I call "Climb to the Top". Then attach each sticker to a different side of the die. 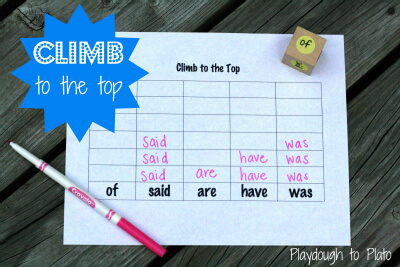 Give your child the Climb to the Top game board, a marker and the die you created. Ask her to roll the die and write down the word that lands on top in the correct column. The word that fills up its column first is the winner. Your child will love rolling and writing her way to memorizing sight words!! Malia is a National Board Certified elementary teacher and the blogger behind Playdough to Plato - a site dedicated to helping parents teach their children to read in 20 fun-filled minutes a day. 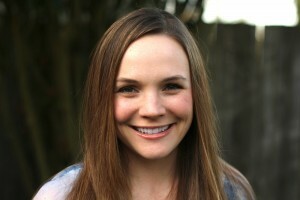 Explore her blog, become a fan on Facebook, and follow her on Pinterest. What a great way to work on words! What fun! I am going to use this as a spelling game. Thank you! 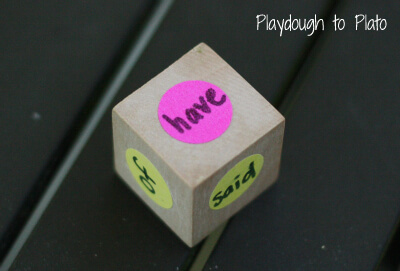 Wow, dot stickers to make the die, great idea, love this! That is really fun - thanks for the great idea! Malia, thank you so much for sharing this with us. I love how you used the stickers - totally makes the block reusable! I need to get one of those blocks.